What’s In the Shatterizer Black box? 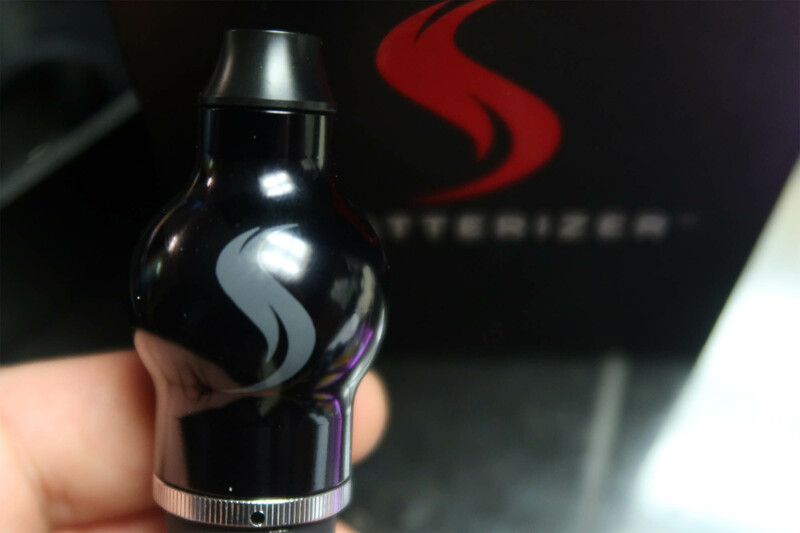 The Shatterizer is a vaporizer pen that really focuses on quality of your concentrate hoot, and you will understand what we mean by the end of this segment. So what is it exactly? 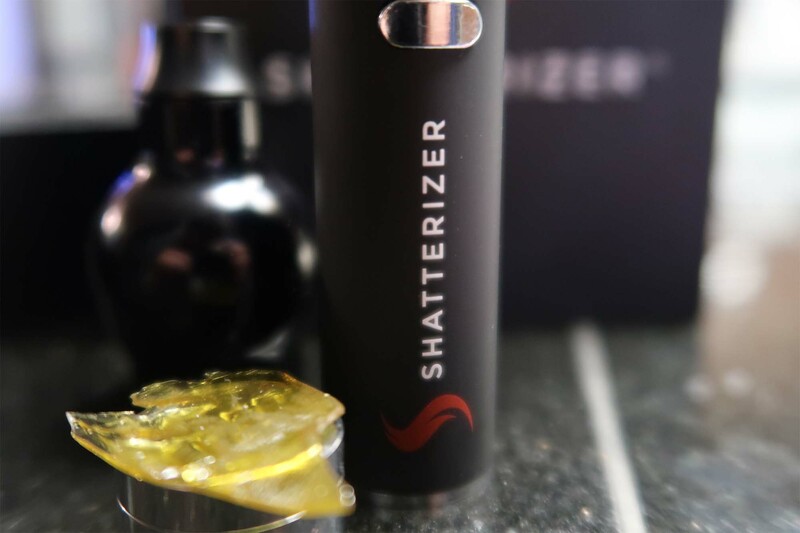 Shatterizer is the name of the brand and their proprietary cannabis concentrate vape pen, which comes in 3 different variations, Shatterizer Black, Shatterizer Silver and Shatterizer regular. This shatter pen shares similarities to the Yocan XL line in regards to the battery supply and the magnetic carrying case. For those familiar with these 11 mAh batteries, this is a durable battery with a long life and it can definitely handle a few falls to the pavement as I tend to do when I miss my pocket. All 3 Shatterizer pens offer the same set of features with variable outside colors. A dependable battery base with 3 power settings. Simply click 3 times to change to a stronger setting. If you’re only on to once type of extract the variable temperatures might not have that sparkle, but for those swapping between waxes, shatter, oils, budder and others. The main difference between the Shatterizer and other competing brands is the proprietary “globe” that fits on top of the coil. The glass “globe” works to peculate the air flow, and you will understand the importance of this addition when you try this unit out. Traditional vape pens offer a straight shot to your lungs, drying them out and sacrificing the flavor of your hoots with harshnesss. Shatterizer focused this pen on hoot quality, and it shows from pull one. The globe difuses the hoot, cools the vapor and allows your lungs to enjoy the experience far greater than competing vape pens. Expect a vaporizer that preserves your lungs and brings the terpene flavor profile you’ve been hoping for. The Shatterizer boasts a 1100 mAh lithium ion battery that with a full charge will last about 70 hoots over 3 hours. Not only does this battery pump out the power, it also stays functioning for up to 15 seconds on each hoot for those who have well trained lungs. 5 clicks turns the device on and off. I really enjoy the variable colors for each setting, these actually came in handy quite often, especially at night outdoors or watching a movie. The Shatterizer vaporizer sacrifices a little bit of size for hoot quality, but this isn’t a bad thing. The trade off is about a CM of extra width in exchange for arguably the best hooting pen on the market. Shatterizer vaporizers work best for those who are seasoned veterans and put emphasis on the quality of their smoke. The globe means it’s going to be easier to toss the pen in your car, a purse or a carrying case, but it’s still small enough to fit your pocket. What’s awesome is the fact that the Shatterizer breaks down into pieces really easy. The rubber seal gives the globe an easy connection to pop and and off when it’s time to clean, reload or dismantle. Shatterizer’s hashtag #PerfectClouds is no joke. This is the best vape pen with variable settings for multiple extracts. In combination with a powerful battery, the Shatterizer is a great option for those who are going to be out and about for an extended period of time while maintaining the need to swap between product consistencies. This is one of my top vape pens for hanging around the house, or going to a local festival (when I have something to carry it in). Make sure you have a purse to carry your Shatterizer, the top globe is a little bulky and could be a little fragile in the pocket. If you have a bag, murse, purse or car to keep your pen close by while you venture around, the Shatterizer is ideal to take out with you! The Shatterizer is a vape pen that really focuses on quality of your hoot, and you will understand what we mean by the end of this segment. So what is it exactly? Shatterizer is the name of the brand and their proprietary cannabis concentrate vape pen which comes in 3 different variations, Shatterizer Black, Shatterizer Silver and Shatterizer regular.